ThomasShepardLibrary is a Legacy Library. Legacy libraries are the personal libraries of famous readers, entered by LibraryThing members from the Legacy Libraries group. » Thomas Shepard's legacy profile. ThomasShepardLibrary is also an author. About meThis collection includes books owned by the three Thomas Shepards, each a minister in early New England. Thomas Shepard I (5 November 1605 - 25 August 1649), was born in Towcester, England. A graduate of Emmanuel College, Cambridge (B.A. 1623/4, M.A. 1627), Shepard emigrated to Massachusetts in 1635. He preached in the church at Cambridge until his death. Shepard took an active role in church leadership and the foundation of Harvard College. Thomas Shepard II (5 April 1635 - 22 December 1677), was born in London, England, and came to Massachusetts with his family very early in life (he was just a few months old). He graduated from Harvard College in the class of 1653, and was named a fellow of the college in November 1654. Shepard was ordained a minister in 1659, to preach in the church at Charlestown (he held the office of teacher). He served in that capacity until his death. In 1664 Shepard was named a censor of the press, and he preached the 1672 election sermon. Like his father Thomas Shepard II took an active role in the governance of Harvard College. Shepard died during a smallpox epidemic, after having visited a parishioner who was suffering from the disease. Thomas Shepard III (3 July 1658 - 8 June 1685), was born in Charlestown, MA. He graduated from Harvard College in 1676, and was ordained as pastor at the church in Charlestown. Shepard's career was cut short by his early death, which Cotton Mather describes as arising from an indisposition of the bowels. About my libraryThomas Shepard I left his library in his will to son Thomas, giving him "all my Bookes, manuscripts & paper which last named, viz: bookes, manuscripts & papers, although be propriety of my sonne Thomas yet they shall bee for the use of my wife and my other children." The 1679 inventory lists, as the final item "about two hundred and sixty printed bookes" valued at £100, noting that they are to go to son Thomas. In his will, Thomas Shepard II left to "my son Thomas my whole library, both printed books & writings, which though the property of my son, shall be also, occasionally, for the use of my wife, & daughters, as they may need, and desire the perusal thereof." His inventory lists "his Library", also valued at £100. Thomas Shepard III's unexpectedly early death meant that he died without a will. His widow Mary (née Anderson) later married Rev. Samuel Hayman. Hayman died 1712; his will doesn’t mention a library, and there is no inventory. Mary died 1717; her will also doesn’t mention a library, and there is no inventory. Thomas and Mary had one surviving child, a daughter Anne who married Col. Henry Smith, son of William "Tangier" Smith, St. George's Manor, Setauket, Long Island. In his Magnalia Christi Americana (Volume II, p. 124 of the 1820 edition), Cotton Mather writes of Thomas Shepard III: "... his piety was accompanied with proportionable industry, wherein he devoured books even to a degree of learned gluttony; insomuch, that if he might have changed his name, it must have been Bibliander. ... he had hardly left a book of consequence … in his library (shall I now call it, or his laboratory) which he had not so perused as to leave with it an inserted paper, a brief idea of the whole book, with memorandums of more notable passages occurring in it, written in his own diligent and so enriching hand." The books included in this catalog include all those we know were owned at some point by one of the three Thomas Shepards. 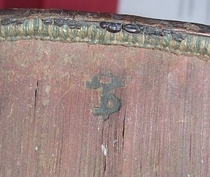 Interestingly, many of these volumes include a brand, or stamp, of the initials "TS" on the top edge (see photo above). This is, so far as we know, a very uncommon practice in early New England. See the Comments field for notes on marginalia, non-Shepard ownership of the volumes, and information on where these volumes are now held. This catalog is a collaboration between librarians at the various Shepard-holding institutions, including Stephen Ferguson at Princeton, Jeremy Dibbell at MHS, Diann Benti at AAS, and John Overholt at Harvard.